I have a new belief. The word “entrails” should not be used more often than necessary, possibly never and certainly not more than once a book. I’m not sure how often “entrails” was mentioned in The Sorcerer’s Garden but it was, per my new belief, too many times. I am well aware that not everyone has the same beliefs as me (My own husband, for instance, can not seem to grasp the fact that sheets should never be tucked into the bottom of the bed when you go to sleep or your feet will suffocate in the confined space). To each his own. If you are of the type that does like such things, I have a book here for you that is chock full of amazingly detailed, exciting, graphic fight scenes, complete with gushing blood, rolling heads and… entrails. If you have a similar belief system as I do, I have a book here that is hard to put down. There is a story within the story and when the main character starts showing up in the story within the story, well even a bit of entrails couldn’t stop me finding out what happened next. And if that sentence confused you a little bit, I understand, it was a little bit confusing, but in a good muddled-for-a-purpose sort of way. Would I recommend it? Here’s the thing, entrails aside, I didn’t love the wrapping up of the plot. Not the actual ending, that was great, but the part that would have been the Clue master proclaiming “It was Mr Green in the conservatory with the lead pipe!” Which was sad because the rest of the book was engaging with likable characters and sprinkled with humor. But who knows, maybe it was just me. I always was more of a Colonel Mustard type, perhaps you’ll like it, just watch out for those entrails! Hey did you know that not only do I love books but I love sharing books too!?! November’s Book at the Door giveaway is open- come and enter I’d love to send you a book too!!! This entry was posted in book review, NanoPoblano and tagged book, book review, CheerPeppers, fantasy, NaBloPoMo, NanoPoblano. 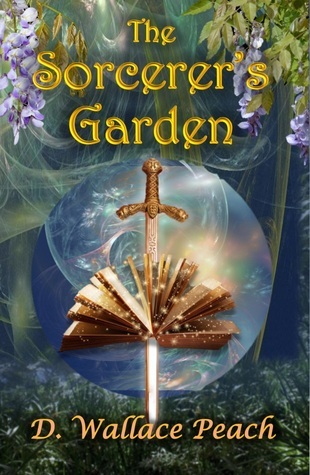 The Sorcerer’s Garden sounds intriguing, entrails notwithstanding! Ha ha. Hope I don’t step on any. Thanks for the review, Jessie. Sorry about the entrails. Ha ha. I don’t even remember using that word 🙂 I’m glad you found the book a worthy read despite the entrails. Happy reading.